The results of R&D activities on the inclusive design led us to the assistive devices for the elderly and people with disabilities. 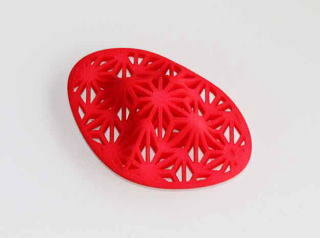 Recent advances of 3D printing make it possible to convert ideas immediately into shapes and to evaluate them. 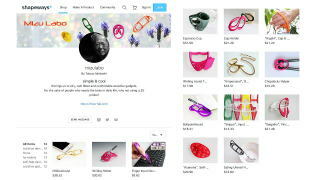 Our products are shown at Shapeways and Rinkak site. 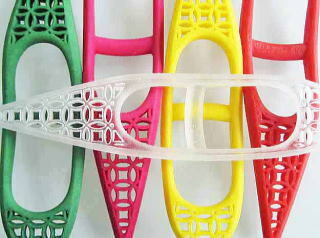 There are so many talented designers and engineers utilizing 3D printer over the world. We advocate that many people can live cooperatively by means of exerting thier creative ideas to the elderly and people with disabilities. 1.Click the product image you like. 2.Go to the shop and find your favorite. "Shippo” is the tool for tapping keys of PC, remote controller, etc, and is not a young fox demon of animes. The input by fingers is one of daily actions. Therefore, if people have disabilities, it makes them feel uncomfortable. 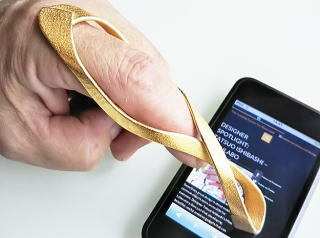 This item is very helpful for tapping keys and is very easy to wear. The name “Shippo”, meaning a seven treasure in Japanese, is that of the Japanese traditional pattern. It has a history of more than one thousand years. 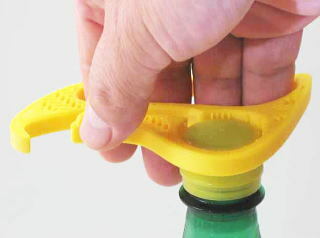 "Higaki” is the tool helping easily to remove a cap or tab from bottles. When the gripping is hard, it smoothly assists you with low physical effort. Because it has the unique decorative handle offering the comfortable holding gesture that makes it more effortless to grip. The name “Higaki”, meaning a fence of cypress in Japanese, is that of the Japanese traditional patterns. This pattern has a history of more than one thousand years. ”Seigaiha” is the tool for peeling a lid film from vacuum packages by pinching and pulling. It is hard to open a lid of the packages by fingers if you have muscle weakness. No more asking for help. The tool has the unique decorative handle offering a comfortable holding gesture that makes it more effortless to pinch. It assists you with low physical effort. The name “Seigaiha”, meaning blue sea waves in Japanese, is that of the Japanese traditional design. This pattern originates from the Persia and has a history of more than one thousand years. ”Asanoha” is the tool for stimulating pressure points of a hand or foot. It is effective for relaxations pressing the reflex areas of palm and arch of the foot. The name “Asanoha”, means a hemp leaf in Japanese, is that of the Japanese traditional design. This pattern has a history of more than one thousand years. In using as a self-massage tool, please use a comfortable pressure. Don’t apply too much pressure. This is the tool for helping people write with a ballpoint pen. Handwriting is daily activity, but it is hard for people with a disability. This item has a light weight and is easy to put on. It is recommended to be used together with “Zebra New Hard BN-5200” ballpoint pen. (For the sake of simplification of a chucking method, we limited the device for one kind of pens.) Put the pen into the chuck by pushing. Mount them on 2D (Index) and 3D (Middle) finger. Can operate with lateral motion and slight rotation of a wrist. Caution: The use of pens with diameter of more than 8.5 mm will cause damages of the chucking parts. Zebra New Hard BN-5200 is available on Amazon and etc. The device for tapping PC keyboard, remote controller, etc. The finger input is daily activities. Therefore this causes a decrease of QOL (quality of life) for people with disabilities like muscle weakness. It is the excellent input device because of being light and easy to put on. The circle design was inspired by the Fibonacci number. Please refer to the photos in use. 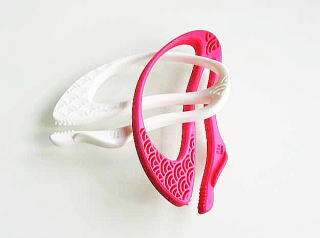 Unlike common openers, the unique shape helps to handle comfortably, so that the elderly and people with muscle weakness can use it smoothly. The name “Ampersand” comes from the shape, “&”. Both simplification and integration of three functions resulted in this shape. 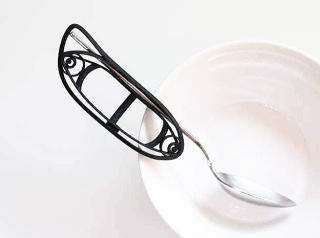 The holder for people who have difficulties to hold a spoon or fork by reason of muscle weakness and so on. Gripping is not required for holding because the side clip of the holder tightly holds the spoon. Able to use a standard spoon with thickness of around 3mm (handle). 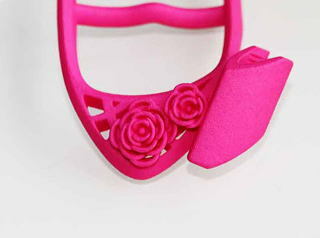 The method for mounting on 3D (Middle) finger is shown in the video of shop site. 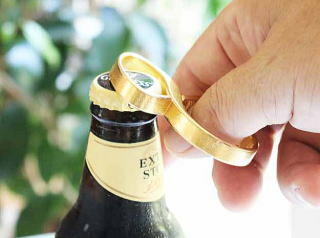 The holder fits around fingers and is fixed securely to the hand. 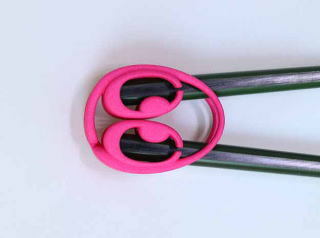 The holder can accommodate a variety of finger because of the unique shape, and is also easy to put on. 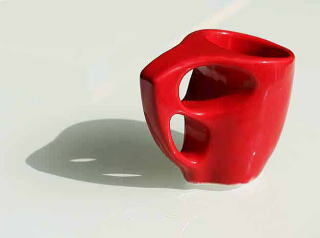 This espresso cup has a unique shape designed for the elderly. Can hold it with a thumb and palm comfortably. 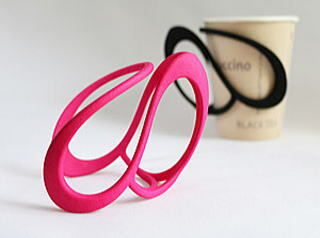 The cup handle has the shape that fits around the palm so as to be held securely on the hand. The volume is 50ml. "Easy for the elderly" means "easy for all the people“ . Every person can enjoy a coffee break with this smart cup. Eating with chopsticks might be fun in sushi restaurants. The adorable chopsticks helper makes it comfortable even on your first try. Look at the video at shop site that shows how easy it is. Fits most standard chopsticks (diameter of around 8mm ). Designed for the elderly and the people who loves chopstick cuisine. "Easy for the elderly" means "easy for all people“. This makes you awesome in a coffee break. The continuous line shape represents adorable and endless images. The handle is big so as to enable to hold with a thumb and a palm even for the people with muscle weakness. Suitable for 7oz ( 200ml volume ) paper cup. Assistive devices must be "cool" so that anyone can love them.. It is hard for people with disabilities to use writing tools. This can be helpful for writing with a ballpoint pen. It is not only light and easy to put on, but also is possible to use many types of pens. Mount the pen in the holder chuck. Attach it to the index or middle finger. Can use both right and left hands. It is recommended to use the pens with a rubber grip. Can easily operate with lateral motion and slight rotation of your wrist. 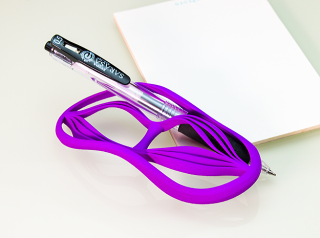 This self-help device can be helpful for writing with a ballpoint pen. It is not only light and easy to wear but also is possible to use the commercially available pens. 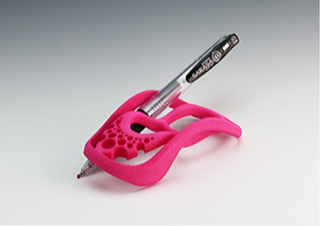 Mount the pen in the holder chuck and attach to your finger. Can easily write with lateral motion and slight rotation of your wrist as shown in the video of shop site. Also adaptable both to right and left hand. It is recommended to use pens with rubber grips. Caution: The use of pens with diameter of more than 11 mm will cause damages of the chuck. Holder for a cutlery. Useful in use of a spoon, fork etc. 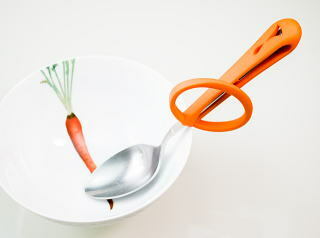 Different ways of holding are possible, and many types of cutlery can be used. A simple but functional shape satisfy different kinds of needs. Cautions: Please not to open a tip of the holder more than 10 mm.